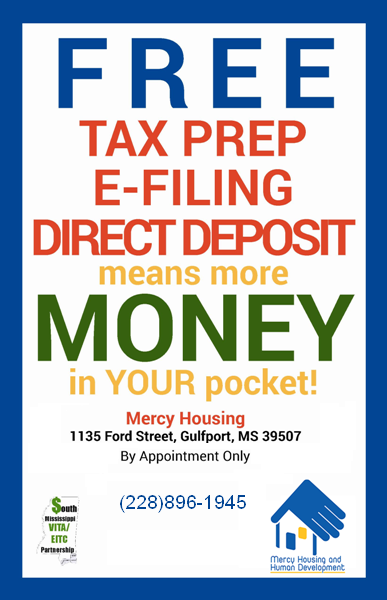 Mercy Housing and Human Development is part of a collaborative with the IRS, National Tax Coalition and South Mississippi Partnership that brings Free tax services to the local community. The IRS Volunteer Income Tax Assistance (VITA) program was developed for individuals that work, but don't earn much money and will save our clients from paying high tax fees such as $200-$300 per tax return. In turn, the client has kept their money to save or pay off debt. The money saved from paying inflated fees to "for-profit" tax services is money that will be put back into the pockets of our clients, thus remaining in our community. MHHD has IRS-certified employees that provide valuable free basic income tax preparation to qualified clients across the three coastal counties. Our knowledge about special tax credits such as Earned Income Credit will be beneficial for our clients. We encourage our clients to make an appointment, please call us at 228-896-1945 for scheduling.